Up, down, ceiling, floor or multiples… and you thought rounding numbers was simple! Rounding numbers involves replacing a number with one of approximately the same value but with fewer digits. 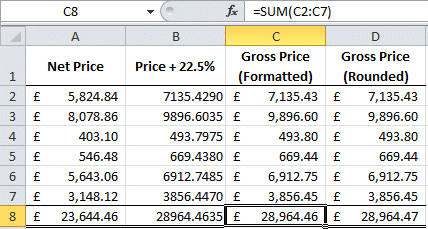 Rounded numbers do therefore inherently introduce a certain level of inaccuracy into calculations which can become an issue, for example when completing a business model spreadsheet, so at the end of the blog some of the alternatives to using a rounding function will be discussed. Rounding is obviously just one of the topics discussed in our classroom Excel courses. 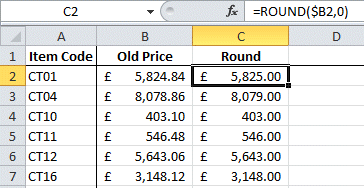 There are however several functions that can be used to round numbers in Excel and which one you pick depends on whether you want to round up, down or just to the nearest integer or chosen multiple. This blog will look at the variety of rounding functions, how to use them and what results you can expect to get! The INT function effectively rounds down to the nearest whole number. Num_digits has nothing to do with cold fingers. If you added -0.01 to the end of the formula, all your prices would be rounded to the nearest £XXX9.99! Rounding up or rounding down? 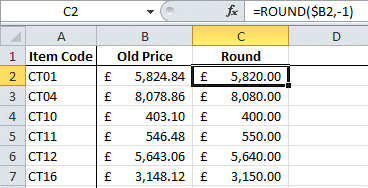 If you need the ability to specify decimal accuracy but want to force the calculation to either always round up or round down then consider the ROUNDUP and ROUNDDOWN functions. ROUNDUP and ROUNDDOWN override the round half up rule. Sometimes you might wish to round to a multiple of a specified amount that isn't 1, 10, 0.1 and so on (which can be achieved with the standard ROUND function shown above). 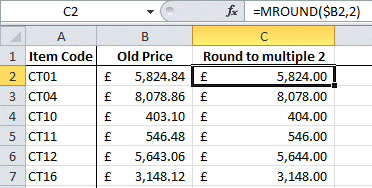 If you wished to round to the nearest multiple of, say, 2 then the best function for this would be MROUND. The effect of the formula in this example is to round to the nearest even integer. The last pair of rounding functions combine multiple rounding with the ability to decide whether all numbers should be rounded up or rounded down to the given multiple (known as the multiple of Significance in these functions). Both these functions round to a specified multiple. Note that the SUM calculation isn't itself rounded, but the numbers it is adding up are. The effect of rounding in the above table is admittedly made worse by the choice of numbers. When a column consists of many numbers, some of which will be rounded up and some of which will be rounded down based on the round half up principle, the sum of those numbers may well be not too inaccurate. Of course, if a totally asymmetric rounding function is employed, such as ROUNDUP or ROUNDDOWN, then the errors are greatly increased. Summing is only part of the story though, and if multiplier values were rounded and then used several times within a calculation it is easy to see how considerable inaccuracies can occur. 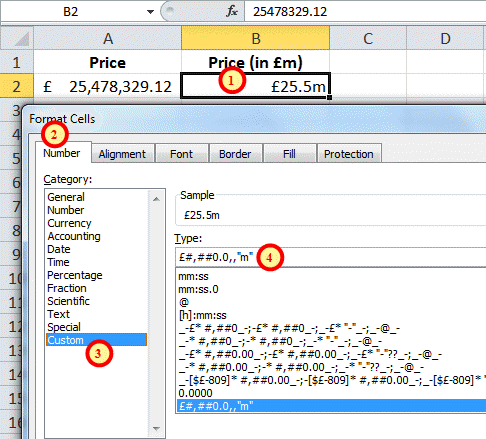 Consequently, it could be regarded as best practice to avoid using rounding functions completely, or at least reserving them for the final figure, and instead utilising some number formatting tricks to show the style of number required without affecting the underlying value. 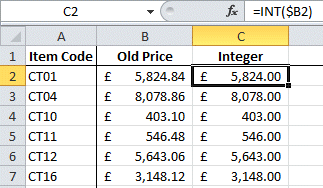 While the total for the formatted column doesn't look like it has added up correctly (1p short! ), the answer is in fact more accurate that the total based on the rounded numbers in column D.
As well as using the preset number formats in Excel, a common use of custom number formatting would be to show large numbers in thousands (k) or millions (m). By using such formatting, the number £25,478,329.12 could be shown to be approximately £25.5m, though the original number would still be used in other calculations. If the number had been rounded to that figure with a function, or combination of functions, it is clear that the potential inaccuracies could be huge. Follow the steps below to create this format. 2. Click on the Number tab. 3. Choose the Custom category. 4. Enter the format shown in the Type field. Each comma is a thousands separator, so the last two lots of thousands are not shown, and the text to be added must be bounded by speech marks. You can see from the formula bar in the screen capture above that the full un-rounded number is still held in the spreadsheet for further calculations.